2 Beds 2 Baths 1,271 Sq. 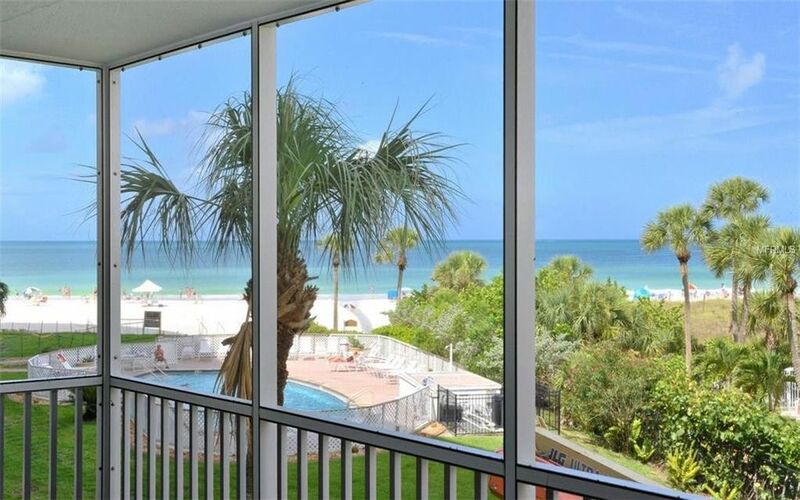 ft.
Gorgeous totally re-modeled turn-key furnished "Floridays" 2BR/2BA split floor plan with beautiful Gulf views from all the windows in this much sought after community of Crystal Sands. Walk the stairs to the third floor or ride up in the glass elevator looking out over Siesta Key. New installed hurricane impact sliders in living room and both bedrooms along with plantation shutters on windows and sliders throughout. Kitchen opens up to view the living room area and Gulf views and has large granite gathering bar with several chairs. Stainless Steel Kitchen Aid appliances and granite backsplash and inlaid specialty tiles over sink. Living room area has been completely redecorated and replaced with lovely furniture and accessories. Entire condo has been re-painted. Three flat screen tv's throughout condo. Large master bedroom features king size bed and night stands, computer and printer on desk and large walk-in closet. Master bath features double sink vanities with glass block shower and dual rain water shower features. Guest bedroom has large walk-in closet and a second closet and the bedroom features a wrought iron queen bed and a iron twin bed. In-unit laundry room with washer and dryer for your convenience. Crystal Sands offer two week rentals and has a rental office on-site. Two heated pools within the complex. Covered parking. Very close to the Siesta Key Village and lots of restaurants and shops in either direction. Don't miss out on seeing this beautiful unit!